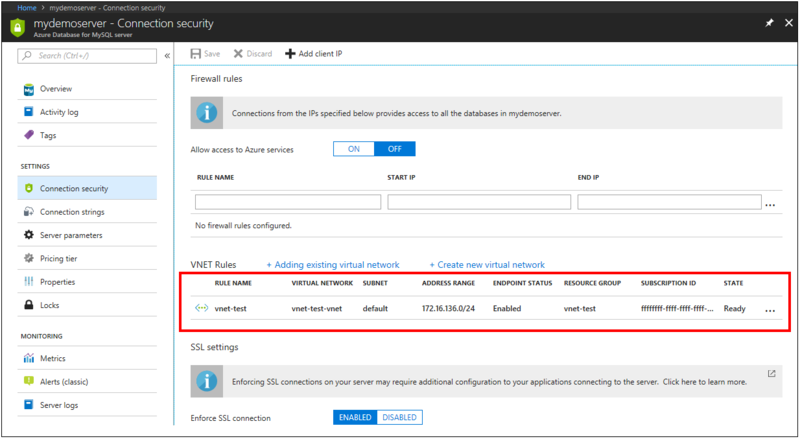 Virtual Network (VNet) services endpoints and rules extend the private address space of a Virtual Network to your Azure Database for MySQL server. For an overview of Azure Database for MySQL VNet service endpoints, including limitations, see Azure Database for MySQL Server VNet service endpoints. VNet service endpoints are available in all supported regions for Azure Database for MySQL. Support for VNet service endpoints is only for General Purpose and Memory Optimized servers. 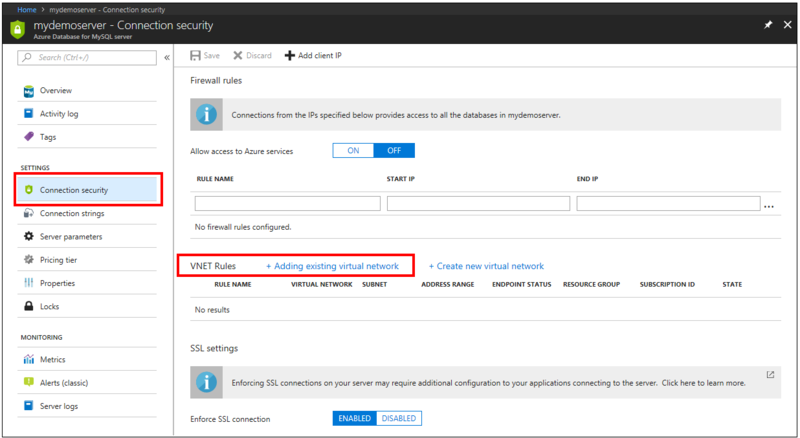 In case of VNet peering, if traffic is flowing through a common VNet Gateway with service endpoints and is supposed to flow to the peer, please create an ACL/VNet rule to allow Azure Virtual Machines in the Gateway VNet to access the Azure Database for MySQL server. On the MySQL server page, under the Settings heading, click Connection Security to open the Connection Security pane for Azure Database for MySQL. Ensure that the Allow access to Azure services control is set to OFF. If you leave the control set to ON, your Azure MySQL Database server accepts communication from any subnet. Leaving the control set to ON might be excessive access from a security point of view. 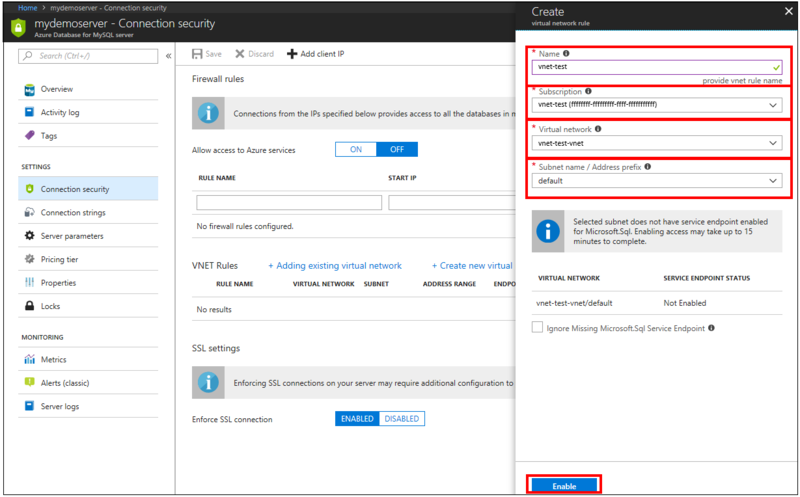 The Microsoft Azure Virtual Network service endpoint feature, in coordination with the virtual network rule feature of Azure Database for MySQL, together can reduce your security surface area. Enter a VNet rule name, select the subscription, Virtual network and Subnet name and then click Enable. This automatically enables VNet service endpoints on the subnet using the Microsoft.SQL service tag. It is highly recommended to read this article about service endpoint configurations and considerations before configuring service endpoints. Virtual Network service endpoint: A Virtual Network service endpoint is a subnet whose property values include one or more formal Azure service type names. VNet services endpoints use the service type name Microsoft.Sql, which refers to the Azure service named SQL Database. This service tag also applies to the Azure SQL Database, Azure Database for PostgreSQL and MySQL services. It is important to note when applying the Microsoft.Sql service tag to a VNet service endpoint it configures service endpoint traffic for all Azure Database services, including Azure SQL Database, Azure Database for PostgreSQL and Azure Database for MySQL servers on the subnet. Once enabled, click OK and you will see that VNet service endpoints are enabled along with a VNet rule. Similarly, you can script to Enable VNet service endpoints and create a VNET rule for Azure Database for MySQL using Azure CLI.